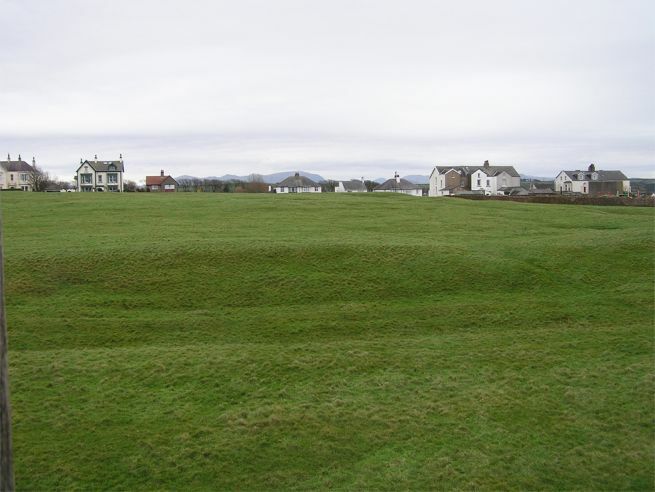 The point, though, is that it’s all that’s currently visible of the Roman fort at Maryport, on the Cumbrian coast. This was one of a chain of defences built to keep an eye on the marauding northerners, lest they sneak around the western edge of the border. Had it not been perishing cold when we were there last year I’d probably have another photo of the empty field next door to this, where the garrison’s civilian hangers-on used to live. Pretty soon, though, there should be better photos to be had – because they’re going to dig, hooray! Who knows what wonderful things are lying there waiting to be found? Whatever they are, they”ll be displayed in a new museum on site. The name of Rianorix, a character in the second Ruso book, came from a tombstone at Maryport. With luck, we’ll find out more about the lives of the real Rianorix’s friends and relations. There are plans to get a lot of the work done by 2012, so there won’t be long to wait. When I lived in the UK, my parents used to take us to Waterhead, near Ambleside. Opposite the house where we stayed (Borrans Court), there was some sort of grassed-over village which I believe had a plaque saying it was of archeological significance. That might have been Roman too. Much later in life, I saw a part of Hadrian’s wall and had a most peculiar feeling of recognition. Maybe my ancestors once lived there. I have now enjoyed both your books in the audio version – Sean Barrett is such an excellent reader – and can’t wait for your latest. Many thanks for being such an interesting and unusual writer, I am sure your research must have been fascinating. Delighted to know you’ve enjoyed the books and it’s great to hear from somebody in New Zealand. Yes, the research is enormous fun: sometimes I feel guilty that I can enjoy myself so much and still call it ‘work’! If you’re ever back this way, you’ll find that much more of Hadrian’s wall is accessible these days and it’s well worth a return visit.